Historical medical journals provide unique perspectives on the development of expert understanding of transmission, morbidity, and impact during an epidemic. Examining the ways that medical journals contributed to the spread of information, evaluation of interpretations, and creation of new knowledge in a specific historical process can contribute to current discussions about the relationship between expert perspectives and public understanding. Information on the Russian Influenza (1889–1890) in the British Medical Journal offers an excellent case study for evaluating historical significance and contemporary relevance. Circulating Now welcomes guest bloggers E. Thomas Ewing, Ian Hargreaves, Jessica King, Andrew Pregnall, and Tyler Talnagi who examine different dimensions of the role of medical journals in collecting, presenting, and interpreting knowledge of a disease outbreak in this last of three posts for our ongoing Revealing Data series. During the 1889–1890 influenza epidemic, the question of how influenza spread became the focus of public discussion among medical experts and can now be explored through the articles published by medical journals. This post combines two techniques, close analytical reading and large scale text interpretation, to explore how contemporaries understood the etiology of influenza and how their understanding shaped expert and public perceptions of the disease. The February 8, 1890 issue of the British Medical Journal published a letter under the headline, “The Etiology of Influenza,” responding to a study of epidemic influenza at a psychiatric hospital in Edinburgh published in the previous issue, dated February 1, 1890. The original study and the letter were both written by physicians, who drew upon their own experience treating patients and documenting the course of the disease to explain the spread and impact of the influenza. The studies, one from the Royal Asylum in Edinburgh by Drs. George M. Robertson and Frank A. Elkins and one from Dr. William Bruce on his observation of his own patients in Dingwall, were similar in ways of collecting, classifying, and analyzing information about the influenza epidemic. The “etiology of influenza,” which Bruce connected to the broader argument for and against “contagion,” is a topic well-suited to large-scale textual analysis of the British Medical Journal, thus demonstrating the value of historical scholarship that combines traditional close-reading techniques with the possibilities of examining extensive quantities of digitized text using analytical tools. Large-scale text analysis provides an alternative method to explore the themes identified by a close reading of these two articles. A frequency chart, Figure 1, shows which medical terms were collocated with infect* and contag* (terms were truncated to recognize variations, such as infection, infectious, infected, infectivity, and infective) in the corpus of the British Medical Journal for one year before and after the Russian influenza, from July 1889 to June 1890. Not surprisingly, common medical terms appear most frequently. This list is suggestive, however, because it identifies a glossary of of specific diseases, in addition to influenza, which appear in proximity to these two terms, including diphtheria, leprosy, measles, pneumonia, as well as tuberculosis and phthisis referring to the same disease), pox (presumably small-pox), scarlet (presumably scarlet fever). 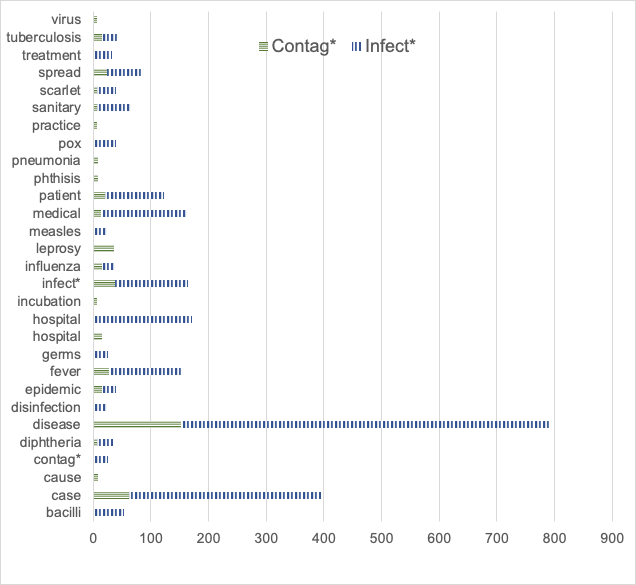 Figure 2 shows how disease terms were collocated with infect* and contag*, as calculated as a percentage of medical terms. with some interesting patterns: influenza and phthisis/tuberculosis appeared in close proximity to both infect* and contag*, whereas small-pox and measles only appeared close to infect* while pneumonia and leprosy were only associated with contag*. A network diagram provides further examples of the collocation of terms, as shown in Figure 3. 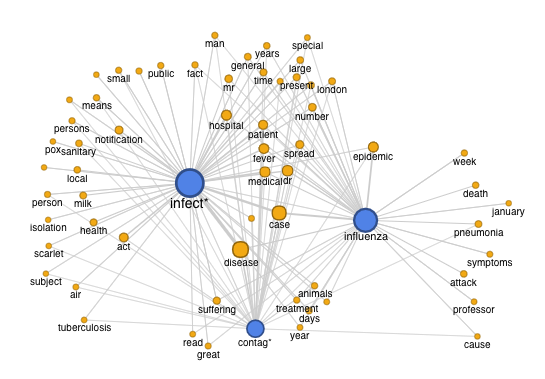 As suggested above, this network diagram shows a clustering of terms connected to all three words (influenza, contag*, and infect*) that were general medical terms (epidemic, patient, hospital, medical, case, and disease). Some of the more interesting terms were located on the periphery, with connections to only one of the terms. Authorities, pox, and isolation were connected only to infect*, while death and attack were connected only to influenza. As with the above chart, this kind of network visualization suggests possible connections that require further analysis in order to make definitive statements about expert understanding of the infectious or contagious nature of influenza. These suggestions can be explored with a hybrid approach that uses large-scale text analysis to identify a smaller set of relevant phrases to be analyzed using a close reading technique. The Voyant tool makes it possible to list more than 250 phrases from one year of British Medical Journal, July 1889 to June 1890, that position the word influenza in context, with fifteen words on either side. Approximately 10% of these phrases also contain either infect* or contag*, thus creating the subset of phrases shown in Table 1 above. An analysis of more than twenty phrases produces the following distribution of answers to the question: during the Russian influenza epidemic, did medical experts consider influenza to be an infectious and/or contagious disease? One-third (7) were interpreted as indicating an affirmative answer, just over one-third indicated that the answer was complicated or contested (8), and a similar share that cannot be classified based on this selection of text. None of these phrases, however, can be classified as denying that influenza is infectious or contagious. Given the complexities evident in the first-hand commentary of the physicians published in the British Medical Journal, the interpretations suggested by large scale text analysis confirm that medical experts were moving toward a consensus belief that influenza was contagious or infectious–but such an understanding was complicated and contested.